John Hennessey's daily driver is a Focus ST boosted to 300 horsepower. Given his reputation for creating some of the most extreme vehicles on the planet, you’d be forgiven for thinking John Hennessey drives to work in a Venom GT or one of his 1,000-horsepower Cadillac CTS-Vs. In actual fact, the tuner’s current daily driver is a 2013 Ford Focus ST, bought for its balance of fun, versatily and economy. Not one for driving cars in stock form, it wasn’t long before John modified his hot hatch to be even hotter. To further enhance Ford's pocket rocket, Hennessey installed a cold-air intake that boosts power by 13 horsepower and remapped ECU that adds 27 hp and 40 lb-ft of torque. A Magnaflow stainless-steel exhaust was also fitted to create a deeper engine note, and has the added benefit of contributing another 7 or 8 horses for a combined total of around 300 horses. Hennessey offers the HPE300 package for $995 (the exhaust is an extra $695), but production will be limited to 300 units, which will receive special badging and an individually-numbered dash plaque. 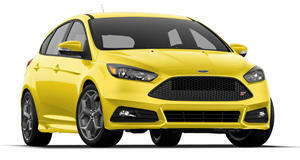 The 250-horsepower Focus ST is a front-wheel drive hot-hatch, so put down Hennessey’s reference to the rear wheels as a simple slip of the tongue, since most of his creations are RWD.